Fiscal-cliff deal: Who are the winners and losers in the bargain between Democrats and Republicans? Surprise! The rich and the elderly win again. 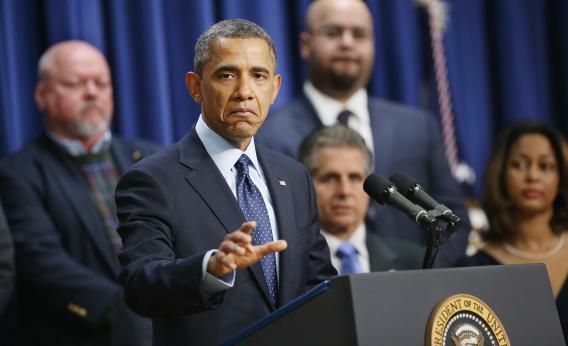 President Barack Obama delivers remarks about the fiscal cliff negotiations on Monday. Rich people: Raising the threshold for higher taxes from $250,000 to $450,000 is a big tax cut for all kinds of rich people, not just those with adjusted gross incomes between the two figures. That’s because taxes are assessed on marginal income, meaning that even if you make $600,000 or even $1 million a year you still have a very large share of your income that’s taxed at a lower rate thanks to this deal. Red-state Democrats: Democrats currently hold a majority of seats in the Senate thanks to senators from such not-so-liberal states such as Louisiana, Arkansas, South Dakota, and West Virginia. If we went over the cliff, this is the group that would be caught in the Obama-Boehner crossfire. A deal lets them duck partisan controversy, which is right where they want to be. Unemployed people: The deal includes funding for a one-year extension of supplemental unemployment insurance benefits. It’s easy for liberals to dismiss this as a GOP concession on a temporary issue in exchange for permanent tax cuts, but it’ll make a big difference in the lives of the unemployed. Doctors: Neither Democrats nor Republicans favored implementing the large cuts in Medicare reimbursement rates for physicians that were scheduled by law, but there was a partisan dispute about how to orchestrate a so-called “doc fix” for 2013 and cliff diving might have at least temporarily hit doctors in their wallets. This deal completely punts on all kinds of substantive issues related to the reimbursement rate issue, but it guarantees that the money will keep flowing for now. The elderly: As recently as yesterday morning, it was taken for granted that one of the major provisions of an alternative to the fiscal cliff would be cuts in the federal retirement security programs that are the main long-term drivers of deficits. But ultimately Democrats cared more about avoiding spending cuts than securing tax revenues, and Republicans cared more about low taxes than cutting spending. Old people are the winners. “Grand Bargaineers”: David Weigel has written elegantly for Slate about Pete Peterson’s decades-long failure to move the needle on deficit reduction, and this week Peterson has failed yet again. The “fiscal cliff” was his best chance yet to secure a grand bargain of big tax hikes and major spending cuts by creating an artificial political crisis that supposedly could only be defused with a huge deficit reduction package. But the win for the elderly was a catastrophic defeat for the grand bargain. Fighting Democrats: The Obama administration has gotten a lot done since Inauguration Day 2009, but what it’s never done is give strong partisan Democrats the kind of to-the-mattresses battle against the GOP that they crave. Most liberals think—and I agree—that had we simply gone over the cliff and had Obama simply insisted on a new tax cut bill with a $250,000 threshold, he ultimately would have won. But success was by no means guaranteed, and ultimately the White House chose not to risk further re-enforcing a sense that the president is a weak poker player. Grover Norquist: The leader of Americans for Tax Reform is hardly the key to anti-tax thinking on the right. But his particular gimmick, a “pledge” to never cast an affirmative vote for higher taxes, had become influential on its own terms. The White House and other pro-deal Democrats see breaking this taboo as an important precedent-setter in its own right. The economy: The deal is being characterized as one aimed at “stopping taxes from going up on middle class families,” but in fact the expiration of the payroll tax holiday means that taxes will go up on working people. Obama started the fiscal cliff talks aiming to extend the holiday or replace it with some other new stimulus ideas. That’s all fallen by the wayside now and for the next two months, the markets will have the shadow of a debt ceiling standoff lurking over its head.